11 January 2019 (Toronto, ON) – Throughout Mary Queen of Scots, composer Max Richter’s score helps establish not only the rich, historically redolent atmosphere of the film but also its profound emotional resonance. Martial drums set against female voices, ambient lyricism and stately dances, stirring melody borne along strings and winds – Richter’s music colors, and deepens, virtually every scene, making the period political drama feel timeless and personal. The original motion picture soundtrack album to Mary Queen of Scots is now available today via Deutsche Grammophon/Universal Music Canada, the country’s leading music company. 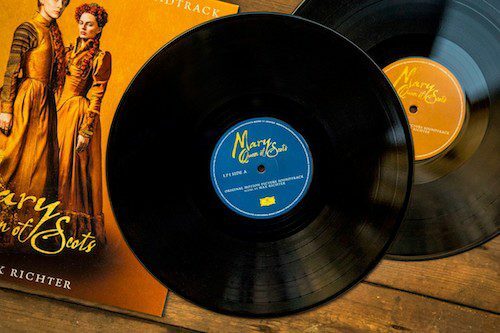 Order the vinyl copy of the Original Motion Picture Soundtrack of Mary Queen of Scots HERE. The film is a Focus Features presentation directed by Josie Rourke and starring Saoirse Ronan in the title role and Margot Robbie as Elizabeth I. The official trailer for Mary Queen of Scots can be seen here. Mary Queen of Scots – based on Dr. John Guy’s book Queen of Scots: The True Life of Mary Stuart – breaks the title figure free from misconceptions of her as a weak or sexually promiscuous monarch. The film depicts the betrayal and rebellion within Mary’s turbulent court, where the men around the queen unceasingly plotted her downfall. The story unfolds against the backdrop of Mary’s relationship with her cousin, Queen Elizabeth I of England. Two women who uniquely understood, captivated and challenged each other, they were both forced to make sacrifices in a male-dominated world – and each experienced the bitter price of power. The Mary Queen of Scots soundtrack album was recorded at Air Studios in London, with Richter producing. The performers include London Voices and the Air Lyndhurst Orchestra, with the instrumental soloists including Jane Marshall (cor anglais), Hugh Webb (harp) and Jean Kelly (Celtic harp). Richter’s score is published by Focus-Gramercy Film Music (BMI). Max Richter, born in 1966 in West Germany, grew up in England and studied composition and piano at the University of Edinburgh, with further training at the Royal Academy of Music in London and with modernist composer Luciano Berio in Italy. Richter’s work embodies both the rigor of the classical tradition and the experimentalism of contemporary electronica. The BBC described his debut solo album, 2002’s Memoryhouse, as “a masterpiece in neoclassical composition.” His music, despite its underlying sophistication, remains accessible. Relatively uncommon among contemporary classical composers, Richter is radically unafraid of appealing directly to our emotions. Numerous classical No. 1 records around the world and sold-out performances at such esteemed venues as London’s Royal Albert Hall, the Sydney Opera House, Philharmonie de Paris and Berlin’s Berghain are a testament to Richter’s wide appeal. Richter’s 2012 Deutsche Grammophon release, Recomposed: “The Four Seasons,” topped the classical charts in 22 countries. The UK’s Telegraph praised the album, stating: “It is a subtle and often moving piece of work, which suggests that after years of tedious disco and trance versions of Mozart, the field of the classical remix has finally become interesting.” DG reissued Richter’s 2010 album Infra in 2014, with the music originally conceived as a score for London’s Royal Ballet. In 2015, Richter released the eight-and-a-half-hour epic Sleep – which explores new ways for music and consciousness to interact. The recent production of the Olivier Award-winning Woolf Works with long-term collaborator Wayne McGregor at the Royal Ballet resulted in a 2017 DG album, Three Worlds, which also topped classical charts worldwide. Richter’s work in film and television includes the Golden Globe-winner Waltz with Bashir, HBO’s dramatic series The Leftovers, Jessica Chastain’s Miss Sloane, Hostiles starring Christian Bale, Charlie Brooker’s Black Mirror and Tom Hardy’s Taboo, the latter of which earned Richter his first Emmy Award nomination. Numerous directors, including Martin Scorsese (Shutter Island) and Denis Villeneuve (Arrival), have employed music from Richter’s catalog. In addition to Mary Queen of Scots, Richter recently scored White Boy Rick starring Matthew McConaughey, as well as the HBO series My Brilliant Friend.